I have to admit the bargin hunter/shopper in me thought about getting up and heading to the stores this morning but it sure felt good to be cuddled up to my hubby in my warm bed at 5am this morning. I’ll just pay a little more and avoid the crowds. We did go to pick out our Christmas tree today. We didn’t bring it home because I am not ready to decorate yet – still need to do some cleaning and organizing before the decorations come out. Our friends Joey and Misty have a Christmas tree farm so that’s where we went in search of the perfect tree. It was really chilly today so it seemed like Christmas is getting closer. You can tell by the picture that Emma was freezing. All this warm weather has been great – but it makes the cold really hurt. We found a beautiful tree – it’s a great place to go if you want to cut your own tree. Yummy and ready ahead of time! 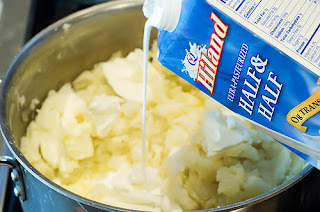 You have got to try these mashed potatoes!! Yeah, that’s half and half in the picture! Made them this afternoon so all I have to do is pop them in the oven before dinner tomorrow. They are SOOOO fattening but it’s a holiday – you can live a little! I got a hair cut this afternoon. I really think I am going to like it. She put lots of layers and used razors and jagged scissors to give it some style. It is straight here and I don’t know how the cut is going to look curly but I’ll find out in a couple of days – think I’ll leave it straight for Turkey Day. Drew also was sporting his mohawk after bath time so he wanted me to take a picture of his hair. I think his is cuter than mine. Here is a great site for fun Thanksgiving crafts and recipe ideas for kids. Check it out. We have had our eye on a Nintendo Wii for a couple of months so we went ahead and ordered one a few weeks ago, knowing that it would be harder to find as Christmas got closer. Every night Mike and I would anxiously wait until the kids were asleep and sneak the games out and play them. After about a week of sneaking we decided to go ahead and let the kids in on the fun. We decided it was more of a family gift and that Mike and I were going to enjoy it as much as the kids. They have really had a great time with it. I was in Walmart last week and they just happened to have Guitar Hero for the Wii so I bought it thinking it would make a great present for my wanna be rock star husband. 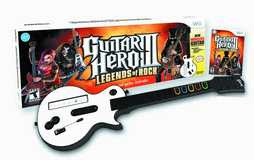 Since we decided to come clean and go ahead and let the kids have the Wii I couldn’t wait until Christmas to give Mike the Guitar Hero so he has been rocking out every night in the living room with a little plastic guitar. I gave it a try and it really is alot of fun. I don’t think I am coordinated enough to be a guitar hero but it’s fun trying.